Home announcements Application Applications Features Review Find Free Wi-Fi Hotspots Worldwide With Wi-Fi Map! 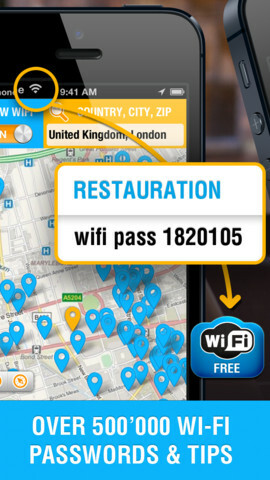 Find Free Wi-Fi Hotspots Worldwide With Wi-Fi Map! 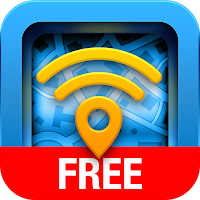 The winner of our Free App Poll this week is free Wi-Fi Map! This free app for iPhone helps you find practically all the Wi-Fi hotspots of our planet! If you are active and dynamic, if you like to have fun and travel then Free Wi-Fi Map is a perfect choice for you to stay online wherever you are! We made a great effort to make the app not to distract you from you main aim – find Wi-Fi and connect with it. Working with our app you will see the map (where you will be the central figure, of course) and blue markers, which designate the hotspots. Click the blue marker – and you will receive all the information about certain hotspot and sometimes even the password. The second way to discover the nearest Wi-Fi is a bookmark “Nearby” where you can find the list of hotspots that a closest to you and the distance between you and the place with Wi-Fi. Sounds cool, right?! After reaching your destination you can help your friends by sharing the hotspot through Facebook, Instagram or Twitter. The last thing to add is that we are now working hard to let you add and correct the hotspots on your own! • share spots in Facebook, Instagram, twitter for your friends and many more! Wi-Fi Map is available in the Apple App Store for free and requires iOS 6.0 or later to be functional on your iPhone, iPod touch, and iPad. The app is fully optimized for iPhone 5 as well.